New home sales fell more than expected during January as buyers stayed away in droves from a U.S. housing market in the midst of a historic downturn. Sales fell 2.8 percent to a seasonally-adjusted rate of 588,000, compared to a 605,000 revised rate for December, the Commerce Department said Wednesday. According to Bloomberg, economists had projected a 600,000 rate for January. Inventory fell to 482,000 new homes, but the drop in inventory wasn't enough to outpace the sharp drop in sales volume. The result was a further rise in the relative supply of new homes, which reached a level of 9.9 months at the current sales rate in January, according to the report. 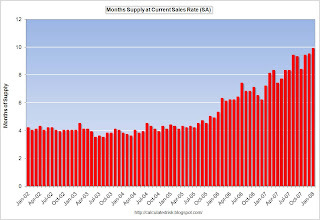 The Calculated Risk blog notes that the sales report is "very weak," likely alluding to the increased supply. The graph to the right, used with permission, provides a historical look at new housing supply. Months of supply is now at its highest level since 1981, likely signaling a further pullback in housing starts from builders in the months ahead.